The Ukraine Crisis and the Russian takeover of the Crimea continue to dominate the attention of the world and will likely have a big impact on world affairs for the future. It is not the first time this has happened with Crimea. To understand the present crisis and its potential impact on the future, a study of the impact of the Crimean War of 1853-1856 should be done. One of the main factors of this war was the conflict of the religions in the region, which will prove to be a major factor for the present conflict as well. The Crimean War in the 1850’s was caused by more than political divisions or ambitions, but by deep religious roots. These divisions were not just between Christians and Muslims, but also between Catholics and Russian Orthodox. One of the basic mandates of the Tsar and a purpose for the Tsarist throne was to be a protector and defender of the Orthodox faith and the Orthodox faithful. This may not be the cause of the present conflict, but it is one of them. The Crimean War of the 1850’s had far-reaching consequences and a major part in setting the stage for World War I, as well as played major roles in the ultimate fall of the Tsarist rule in Russia and the takeover by the Bolsheviks. By losing the Crimean War, the failure of the Tsarist regime to defend the faith and protect the faithful weakened it so that it became increasingly vulnerable and would ultimately be quite easily overthrown after the setbacks of the early fighting in World War I. The point is that the Ukraine and its Crimean province has been a major player destroying empires. When Russia lost the Crimean War, the unraveling of the Tsarist Empire began. In one of the most courageous national movements in the last half-century, the Ukraine voted to separate itself from the Soviet Union in 1989. The Soviet Union immediately began to unravel and collapsed within weeks. Russian power is dependent on this region. There is neither time nor space to examine all the roots and causes in a Bulletin such as this, but even though secular media has trouble seeing, much less understanding, religious causes in such events, there is a religious factor in the present crisis, and it is a major factor. We can also be sure that there will be far-reaching implications from the present crisis in Ukraine. Viktor Hamm, Vice President for Crusades with BGEA, recently had an exclusive interview with the acting President of Ukraine that sheds additional light on this crisis. This is a report sent to us by Charles Chandler, Assistant Editor ofDecision Magazine, who accompanied Mr. Hamm on this trip. Viktor Hamm (right), the Billy Graham Evangelistic Association’s Vice President of Crusades, meets with Ukraine’s acting president, Oleksandr Turchynov on Wednesday. Kiev, Ukraine — In the midst of ongoing turmoil that has enormous global significance, God is mightily at work in Ukraine, the nation’s acting president said Wednesday in an exclusive interview for Decision Magazine. 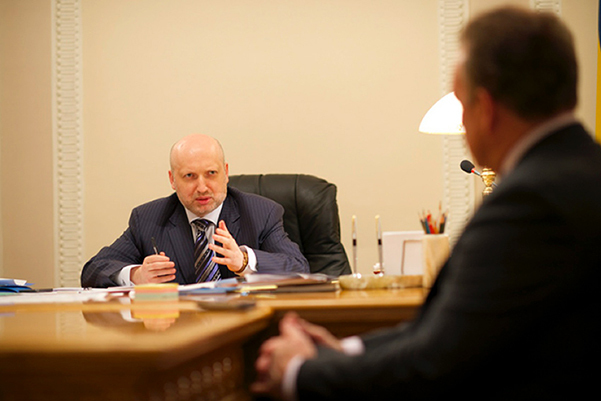 “Stories of God’s hand abound,” Oleksandr Turchynov, a devout evangelical, said during a private meeting with BGEA Vice President of Crusades Viktor Hamm. BGEA President Franklin Graham, who preached in Kiev in 2007, requested Hamm travel to Ukraine and meet with Turchynov because of Hamm’s deep ties to the country. Born in a Soviet labor camp, Hamm has led fifteen crusades in Ukraine between 1994 and 2006 as a BGEA associate evangelist. Turchynov has declined requests from internationally prominent news organizations, but granted Decision Magazine the interview that will appear in more detail in a special report on the Ukranian crisis in April’s edition. Hamm also has met with some of the nation’s top evangelical leaders this week while in Kiev to show BGEA’s support.Decision traveled with him to cover the story that has gripped the world. “Truth was on the side of those who stood for their rights, and (chose not to) be slaves, without rights and without voice,” acting president Turchynov said of the near-miraculous victory of thousands of unarmed protesters over the regime of now-deposed former president Viktor Yanukovych. “All events demonstrated the greatness of God,” Turchynov said. Turchynov was named to his position on February 23, two days after Yanukovych was found to have fled the country amid a massive uprising against his regime. During three months of protests in which Yanukoych’s Berkut riot police beat and shot protesters, it appeared the many freedom fighters had little chance in a David vs. Goliath kind of confrontation. 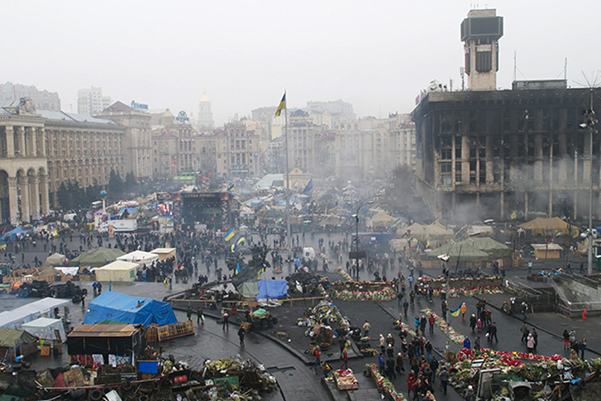 A fiery showdown ensued and hit its violent peak from February 18-20, when Berkut snipers shot down and killed protesters. Nearly ninety have died in all. Yanukovych, who fled on or around February 21, is now charged with mass murder by authorities in his country. Turchynov said only God could have delivered those who refused to be oppressed any longer. The acting president noted how, during the war-like events that took place during the confrontations at Maidan (the city square), huge clouds of smoke would drift toward the Berkut riot police and away from protestors, obstructing the view of the perpetrators. Turchynov said there was also a time when a grenade was thrown near him, but that only one fragment hit him on the cheek, causing no lasting injury. 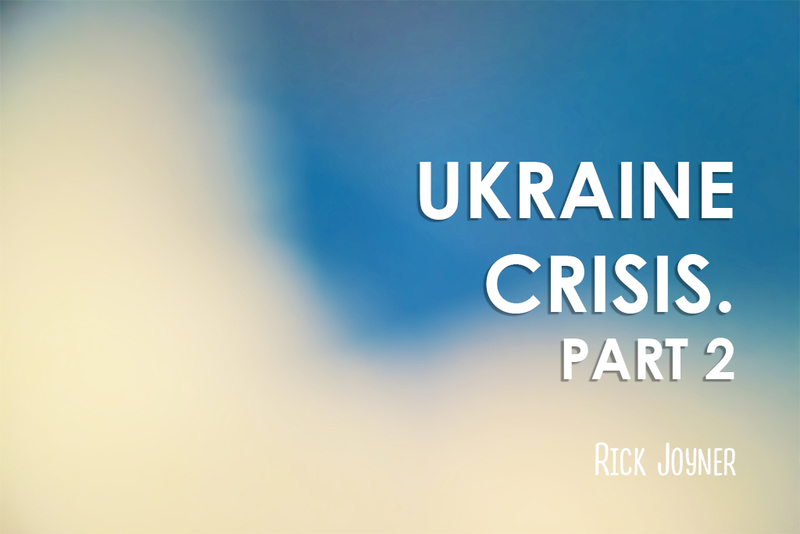 God’s grip on Ukraine has been strong for more than two decades. Hamm says it’s the most evangelical nation in Europe. Ukraine and Turchynov now face another massive challenge—overt Russian interference. Leaders around the world accuse Russia of invading and taking over the Ukranian territory of Crimea. His hope for another victory, preferably without armed conflict with Russia, is based on a Biblical promise. 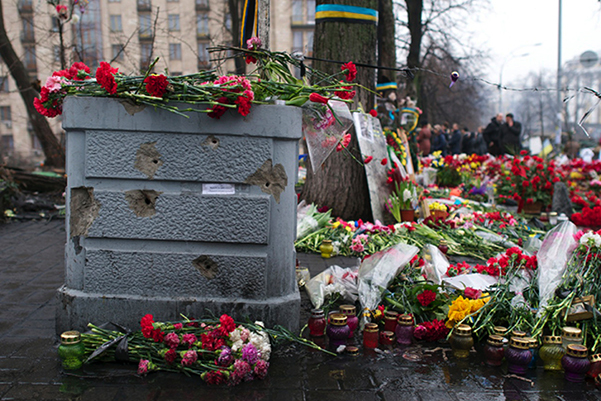 More of the thousands upon thousands of flowers placed in recent days at Maidan, where the confrontations happened most ferociously from February 18-20.